Happy book birthday, Tales from Harborsmouth! We’re celebrating the new Ivy Granger Psychic Detective book release with a party and a giveaway. Keep reading for a chance to win an Ivy Granger Prize Pack, including a flashlight keychain, button, glow-in-the-dark fangs, and a collectible Passport to Ivy Granger booklet signed by the author. 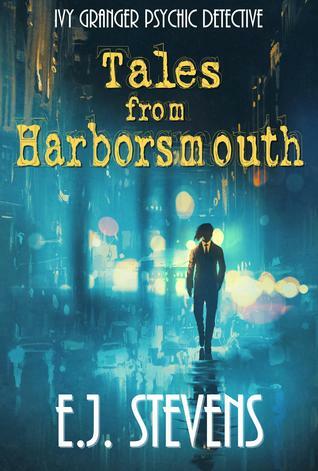 Tales From Harborsmouth is a collection of all the novellas that have been written about Ivy Granger, psychic detective. And while I love the full length books, her novellas are entertaining and usually add more to her overall story. It’s a good day when I get a new book or story about Ivy. Harborsmouth. A city located on ley lines and besieged with the supernatural is Ivy Granger’s work place. As the city’s only psychic detective, she has seen it all or as in the case of Frostbite, she thought she had. This is a short story starring Ivy and her work partner, Jinx, as they try to help a lady that lives in a so called haunted house. Although short, it told an interesting and a bit horrific story and even had a twist to go along with it. Just another glimpse of what Harborsmouth is all about. 4 stars. The longest of the novellas, Blood and Mistletoe takes place during the holidays, but couldn’t be further from a Christmas story if it tried. Forneus, the demon with a huge crush on Jinx, has asked Ivy for her assistance in finding out who is kidnapping and killing all sorts of different fae in the area. Left at each scene is a pool of blood with a piece of mistletoe. This takes Ivy into the bowels of an abandoned hotel that is full of paranormal denizens and not of the good sort. 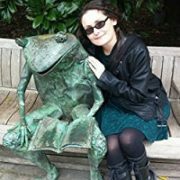 All my favorite characters are back for this installment and as always they are what make these stories for me-including a kitchen brownie, a teenage troll, Kaye, a powerful witch and friend to Ivy, as well as Jinx and Forneus. Paranormal serial killer? It’s all in a days work for Ivy. Well written! 4.5 stars. This novella is broken up into four short stories, each with a different person’s perspective of the same night at Club Nexus, a club for supernaturals to gather and party. In Iced, we get the perspective of a former high born fae woman who is now working as a bartender at Club Nexus. She is spelled to not be able to escape from the club by Puck-the original trickster. She is pushed into something nefarious by a mysterious visitor and gets way more than she bargained for. In Dusted, we get the perspective of a rogue vampire with more than just a taste for violence while having his blood meal. At Nexus, Puck makes sure that the vampire clientele with these proclivities are catered to. In Jinxed, we get Jinx’s view of the events that transpire during her girls night out with Ivy at Club Nexus. Jinx is human and Ivy is half human, and half Fae princess. Most humans would never even know about Club Nexus, but of course Jinx does. She is followed there by Forneus, the demon, who is just trying to keep her safe. Of course, Puck wants to use Jinx for his illicit purposes. Forneus isn’t about to let that happen-hopefully. In Demonized, we follow Forneus and get his view of the events that are unfolding. We also get to read about what he looks like underneath his facade. It’s not pretty and Jinx is a witness as well. Will Forneus ever get to win the girl after this night? I enjoyed how all the events and perspectives came together-very well thought out and written by the author. 4 stars. Torn is another character that fascinates me. He’s lord of the cat sidhe and has been at Ivy’s side during many a battle. For some reason. I picture a younger Johnny Depp when I picture Torn. Ivy gets him to babysit for the kitchen brownie, the teenage troll, and a demon toddler that Ivy is raising. Just because the toddler doesn’t like Torn doesn’t mean anything can go wrong does it? Well of course it does. This is a short story and for me a bit of comic relief for these novellas. This one has a monstrous villain as well as a monster, but still parts of this one will make you smile. 4 stars. Two of these, Blood and Mistletoe and Club Nexus, I had already read, but I ended up fully immersed in the stories all over again-as I was with the two new ones. If you haven’t met Ivy, psychic detective and Harborsmouth hero, then you need to. With Ivy and all the many different characters, the author has created a fascinating paranormal world. 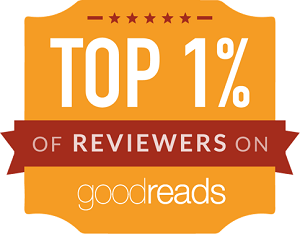 A world I completely enjoy escaping to as quickly as this author writes them. Highly recommended to ages 15 plus. We’re giving away fun swag prizes, but first, grab a cupcake and check out these teasers. Want to read more books in this series? You’re in luck. For more, including a list of her books, freebies, and upcoming events visit her website. We’re giving way an Ivy Granger Prize Pack, including a flashlight keychain, button, glow-in-the-dark fangs, and a collectible Passport to Ivy Granger booklet signed by the author. This giveaway is international. Giveaway begins July 11th and ends July 26th. I haven’t listened to these yet. Maybe I will listen next time because I do love audios. blodeuedd recently posted…Every Heart a doorway and TMST: Do you find it is easier to read and review books that you have picked up on your own? Oh you should if you ever find some time. I know you have a new baby. But they are really good and I do love Ivy! I think you would love these Ali! She has created a whole new paranormal world in the city of Portsmouth. Ivy is a great main character. Oh good! So you know how great Ivy is! I always love these books. E. J. Stevens is a new author to me. This would be my first Ivy Granger book. Enjoy paranormal books and I’m looking forward to reading to reading her book. Oh I hope you enjoy Ivy. She really is different and fun to read about. Still haven’t picked up a book by this author. I know how much you love her work! 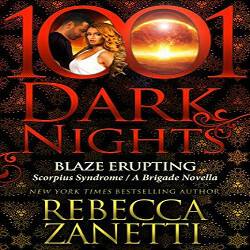 This sounds like a great compilation for fans of her series! Yes, I had already read two of them before, but that didn’t stop me from reading and enjoying them all over again. Love Ivy! I think I need to check this series out! I hope you enjoy it if you get the chance. Really worth reading just to meet Ivy! I really love this series, which I tackle on audio. I’ve read Club Nexus and Blood and Mistletoe, too. I liked how Club Nexus was tackled with the same story from each character’s POV. I wasn’t sure how I would like it, but it worked out really well. I’m hoping that this will end up on audio. I would love to stay in that format. It’s nice they bundled the short stories. I usually like short stories as part of a series :). Sounds like this collection had some great stories!